The ”N” editions of Windows 10 include the same functionality as other editions of Windows 10 except for media-related technologies. The N editions don’t include Windows Media Player, Skype, or certain preinstalled media apps (Music, Video, Voice Recorder). If you use N editions of Windows 10, you must install other software from Microsoft or other companies to have this communication functionality; to play or create audio CDs, media files, and video DVDs; to stream music, and to take and store pictures. 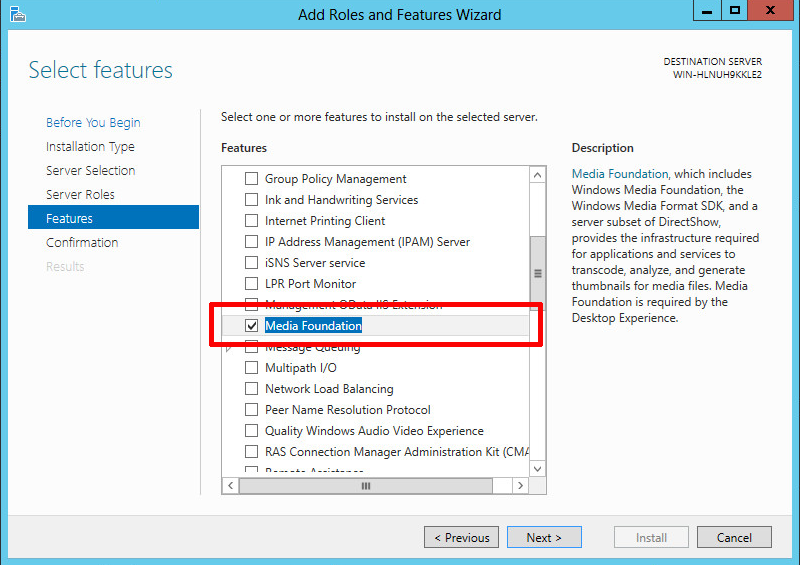 Launch Server Manager (ServerManager.exe), navigate to Manage → Add Roles and Features → Next → Next → Next → Scroll Down → Select Media Foundation → Next → Install.